I don’t know if this happens to any other OCD sufferer but mine can cost me lots of money. And I don’t just mean monthly medication. As one of main issues revolves round contamination I find I can cope with things better if they are bought new. This means no library books, no second hand or vintage shops and a lot of strength for rented DVDs. Unfortunately some times these new things come with marks or dirt on and mind goes wild coming up with all the possible things it could be. I remember shortly before being diagnosed 10years ago buying a gorgeous pair of Sketcher trainers for a fair amount of money. After their first outing I suddenly noticed a mark of one of the laces. I’d been out after it had rained so the chances are very high it was a splash of mud. But my mind wouldn’t accept it no matter how hard I tried to convince and reassure myself. It meant I could never wear them again, the mental anguish just wasn’t worth it. But everyone knew I had new trainers so would be curious why I wasn’t wearing them. I couldn’t tell them the real reason so I bought a second pair. 10years later this still happens, though fortunately for nothing quite so expensive. Mainly now it’s books – I love reading, it’s a form of escapism and relaxation. However if I find a mark I can’t relax any more so have to buy another copy. It means checking everything as carefully as I can before purchase. However I do prefer buying online as it means less people will have come into contact with my item. Recently I had to buy 3 copies of the same book from Amazon to get 1 I was happy with. Fortunately that time I was able to claim refunds on 2 of them, but it took time to sort out. And that kind of thing is tiring. It’s mentally exhausting and the inner battle sounds like 2 people arguing in my head. 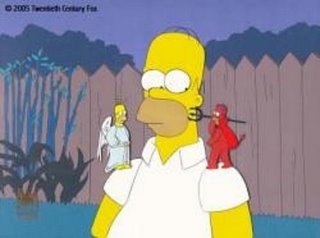 The cartoons where you have a devil sitting on one shoulder and an angel on the other is a good image to describe this with. Has your OCD cost you?